AAA stands for Authentication, Authorization, and Accounting. AAA is a mechanism that is used to tell the firewall appliance who the user is (Authentication), what actions the user is authorized to perform on the network (Authorization), and what the user did on the network after connecting (Accounting). In this post we will focus on the first element of AAA (that is Authentication). 1. User Authentication for accessing the security appliance itself. 2. User Authentication for accessing services through the security appliance. This is also called “cut-through proxy” and is used to authenticate users for accessing Telnet, FTP, HTTP, and HTTPs services located in the network through the firewall. 3. User Authentication for VPN tunnel access (IPsec or SSL VPN). We will see a configuration example for the first type (authentication for accessing the security appliance for management using Serial Console, SSH, and Telnet access). Referring to the figure above, the firewall administrator (Admin) requests firewall access (serial console, SSH, or Telnet) (Arrow 1) for managing the appliance. The ASA firewall (Arrow 2) will request Authentication permission from the AAA server in order to prompt the admin user for Username/Password credentials. After the Admin successfully enters his credentials, the AAA server will give the permission to the Firewall to allow the user in. The “LOCAL” keyword at the end designates the use of the local firewall username database for authentication in case the AAA server authentication is not available (e.g AAA server is down). 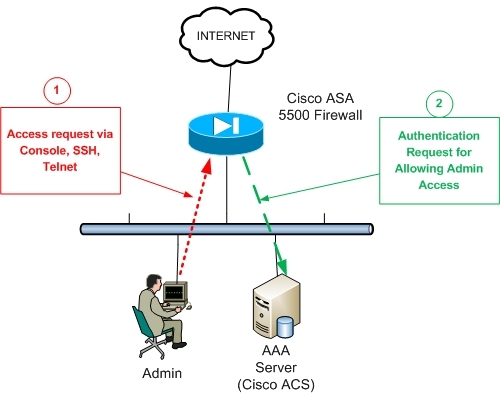 Of course, to complete the scenario above, you need to properly configure the AAA Server with the internal IP address of the ASA firewall and the same authentication key (e.g secretauthkey) as the one you configured on the ASA above.